With planes packed and free coach awards harder than ever to come by, upgrades are one of the best uses of frequent flyer miles. We still refer to them as mileage upgrades because, not so long ago, miles were all it took to upgrade. No more. The trend is toward requiring a cash co-payment in addition to miles, at least for upgrades from the cheaper coach tickets that most travelers normally purchase. American, for example, now charges 15,000 miles plus $50 each way for upgrades from discount coach fares on domestic flights. And for Europe flights, the cost to upgrade is 25,000 miles plus $350 each way. Continental charges 15,000 miles, plus a co-payment between $50 and $150, for domestic upgrades, but the cash surcharges are waived for elite members of its OnePass program. While Delta does not currently impose cash surcharges for upgrades, neither do they allow upgrades from cheaper fares. So you might have to purchase a pricier ticket to use miles, which amounts to an unpublished surcharge. US Airways has no co-pays for domestic upgrades, but upgrading on Europe flights costs 30,000 miles plus $300. And United charges between $50 and $100, in addition to 15,000 miles each way, for domestic upgrades from discount coach; and Europe upgrades cost as much as $500 each way, plus 20,000 miles. In what may turn out to be a sub-trend to the industrywide spread of upgrade surcharges, United has announced that, effective immediately, elite members of Mileage Plus will be exempt from cash co-pays when using miles to upgrade on flights within the continental U.S., Alaska, and Canada, including United’s transcon p.s. service. The new policy applies to Premier, Premier Executive, 1K, and Global Services members, as well as any travel companions included on the same reservation. 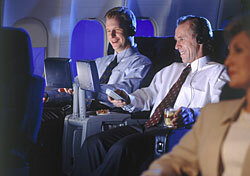 For Mileage Plus members who routinely use miles for upgrades, the waiver adds significant value to elite membership. But there’s a troubling downside to the new policy as well. One of the featured benefits of elite membership is “unlimited complimentary” space-available upgrades on domestic flights. Waiving the cash fee for mileage upgrades—which are confirmed before complimentary elite upgrades—will certainly result in more elites using their miles to upgrade. And that can only mean fewer first-class seats available for elites hoping for a comp upgrade. With so few available first-class seats, it’s a zero-sum game for upgraders. So United is giving with one hand but taking away with the other. No doubt United is well aware of both the positive and negative effects of the change, and is betting that, on balance, Mileage Plus elites will be more favorably disposed to the new approach than to its predecessor. What must also have factored into United’s decision was the beneficial effect on the airline’s books. Frequent flyer miles are recorded as a contingent liability for accounting purposes, and more elite members redeeming more miles for upgrades will reduce that liability. Whether the real-world result will be a liability or an improvement for United’s best customers remains to be seen. It’s too soon to judge whether and how much this will add to the difficulty of getting a complimentary elite upgrade, but I can only imagine waitlists getting longer, especially for lower-level elites. Will the new benefit offset the downside?